Lowland bongo discovered after a long time of secret life in Uganda. The lowland Bongo antelope caught on camera in Semuliki National Park. 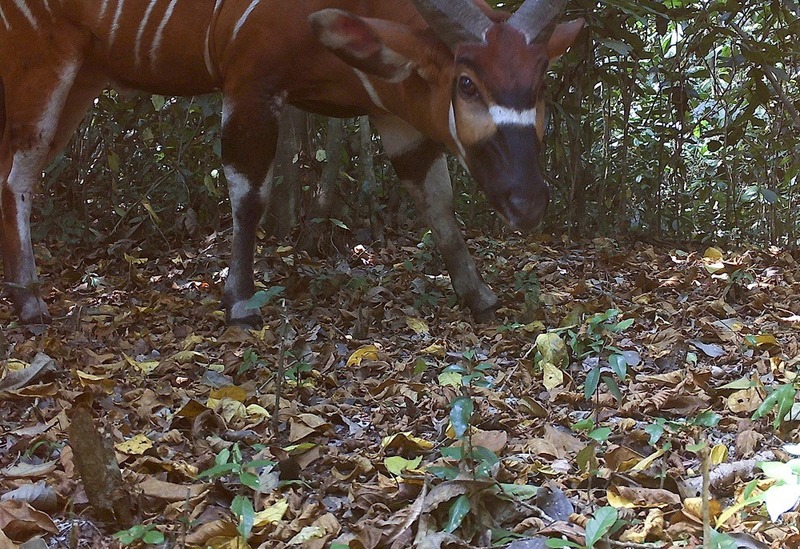 Surprisingly at times we know less than we think we do, the elusive world’s largest forest antelope spotted in Uganda for the first time by motion sensor cameras of the conservationists from Chester Zoo wasn’t thought to have existed in the country. Known as the lowland bongo Antelope (Tragelaphus eurycerus eurycerus) or the western bongo, the forest antelope specie is listed in the near-threatened wildlife species with only about 30,000 remaining in the western and central African forests. It is the first time the Lowland bongo antelope which is the world’s largest forest antelope has been sighted in Uganda after images were captured by the well-placed motion-activated camera traps set up by England’s Chester Zoo in Uganda’s Semuliki National Park. This Uganda wildlife safari park is popular for birding safaris in Uganda situated in the country’s border with the Democratic Republic of Congo. The lowland bongo antelope is endemic to West and Central Africa characterized by a striking red-brown and white striped markings and long slightly spiral horns. Ably standing at 1.3 meters tall at the shoulder and weighing over 800 lbs. for the adult male, the bongo is a shy elusive forest antelope that lives alone in most times. Several other wildlife species that had not been recorded existent in the park before just like the lowland bongo antelope were recorded during this first ever camera trap animal life survey in Semuliki National Park. These include Forest elephants, chimpanzees, buffalos and leopards as well as the smaller, lesser-known animals such as elephant shrews, the common Kusimanse and the slippery African golden cat. These were part of more than 18,000 wildlife images of 32 mammal species captured during the survey. There no bongos conserved in zoos and therefore a great effort on conserving those in their natural habitat by combating illegal hunting, logging and any human encroachment threats is the only way we can continue to see amazing species on a Uganda safari. Let’s have a break from the daily glum of climate change, stories of habitat loss and species endangerment and we appreciate that there is still a true wilderness and something new to be discovered in Uganda. It’s everyone’s duty to conserve this habitat we share with the wild species and with this diversity still discovered in the wild contribute to the conservationist efforts by not destroying the environment.